Naomi Osaka of Japan holds the U.S. Open trophy after beating Serena Williams of the USA in the women’s final of the 2018 U.S. Open tennis tournament at the USTA Billie Jean King National Tennis Center in New York, Sept, 8, 2018. Naomi Osaka beat Serena Williams to win the U.S. Open tennis championship on Saturday. She became the first Japanese player ever to win a Grand Slam title. Two days after the match, Osaka’s victory is still front-page news and leading discussion on television programs in Japan. Osaka was born in Osaka, Japan, to a Japanese mother and a Haitian-American father. The family moved to the United States when she was three. She holds both Japanese and American citizenship. But she has chosen to compete for the Japanese Tennis Association. Osaka’s victory and her respectful behavior have brought national pride to Japan. For now, it appears the country is ready to accept her as Japanese despite her mixed race, a complicated issue in Japan. Japan’s largest newspaper, Yomiuri, called Osaka a “new heroine that Japan is proud of.” The newspaper described her appeal as being extremely strong on the tennis court, but innocent off the court. Junko Okamoto wrote in the weekly magazine Toyokeizai that Osaka’s shyness “makes her look more like a Japanese.” Okamoto also said Osaka could become a face of the 2020 Tokyo Olympics. 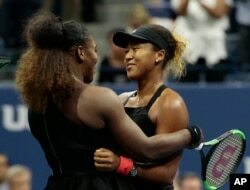 In the United States, much of the post-match discussion has centered on Serena Williams’ controversial behavior during the final. Early in the second set of the match, chair umpire Carlos Ramos called a violation against Williams for receiving coaching from her coach. That is against the rules during Grand Slam matches. Later, Williams received another violation for smashing her tennis racquet on the ground after losing a point. Because it was her second violation, Williams received a point penalty. In other words, Osaka began the next game with one point. During a break, Williams again told Ramos she had not gotten coaching and asked for him to apologize. She told Ramos he would never umpire one of her matches again. She then called the chair umpire a “thief” for stealing a point from her. Ramos then charged Williams with “verbal abuse,” her third rule violation. The third violation resulted in a game penalty. The penalty meant Williams lost one full game. It also put Osaka in an even better position to win the set and the match. Williams’ supporters and some in the tennis world criticized the chair umpire’s rulings, especially the game penalty. Billie Jean King is a former top-ranked player and a women’s rights activist. She wrote on Twitter in support of Williams. "When a woman is emotional, she's "hysterical" and she's penalized for it. When a man does the same, he's "outspoken" & and there are no repercussions,” King wrote. Several male tennis players, including Andy Roddick and James Blake, also came out in support of Williams. Osaka said she did not know what was happening between Williams and the umpire. Phil Dierking adapted the story for Learning English with additional reports from the Associated Press. Ashley Thompson was the editor. Grand Slam title - n. the most important individual competitions in tennis. racquet - n.a piece of sports equipment that is used to hit a ball or other object in games like tennis, badminton, squash, etc.